Welcome back to The Frugal Files!! Recently, I’ve been helping a friend prepare for an out-of-state move. Her biggest task: decluttering. She went through each room to remove items she didn’t want. Then after getting down to the nitty gritty, she found she was just a huge paper pack rat. She literally had binder after binder of “important papers” and “keepsakes”; things she that had traveled with her through 3 states. Because you all know me, you know I was not going to let her take it all to another state. We went through every binder she had from two offices, several cabinets, the basement and her storage. We recycled; we shredded and found a recycling bin close to her home, which was a lifesaver. In addition to paper, she had EVERYTHING in her home, even in duplicate. We organized it and used every resource possible to get rid of it. She freecycled a great deal, but when you have a lot of stuff and moving expenses, it makes sense to make a few extra bucks. How? The good, old Garage Sale. Today, I have tips for the Seller and the Buyer, so let’s begin. As the Seller, you want to make as much as you can. This requires patience and planning. Most people think having a sale is as easy as throwing up a sign and sitting pretty, but there is so much more work involved. First, name the sale. It’s just a garage sale right? Wrong. When people hear or read Garage or Yard sale, they look for bottom basement prices. If you don’t mind letting things for under $2-$3 with most items being 0.50, then those names are fine. If you want more money, purpose to use Estate or Moving Sale instead. Those names appeal to more than just the veteran thrifty that will haggle you about an item that’s a dime. Help the customer know what to expect from your sale. Second, arrange your sale items neatly. If there are items in your sale space that aren’t for sale, remove them or cover them, so the buyer knows they are off limits. Also, messy sales do not typically yield big profits. Clutter causes people to not want to buy, so as annoying as it might be to re-arrange items after someone rummages it through, do it as a courtesy toward the next paying customer. Hang items up if you can, separate them by size and place like items together on your tables. Third, advertise. Don’t just open up shop and rest on your laurels. Tell your neighbors, co-workers and family and tell them to pass it on. Post the information in your online groups, craigslist and the newspaper. Advertise early so people can prepare to come. A tip for multiple day sales: advertise each day individually. When people see signs for multiple days and miss the first day, they will assume all the good stuff was taken and may skip your sale altogether. Another tip, if you live on a side street, post signs on the main street, then help guide the driver all the way to your sale with accompanying signs. Also, don’t be afraid of gimmicks. Note that you have bags and boxes for them. When advertising your great items, consider “Stuff-A-Bag” as part of your sale. Do you have a bunch of little items, but don’t want to bother with coins at your sale? Then put those items in one section and give people a bag or box. Give them a set price and tell them they can stuff whatever they can fit in their bag, from that area, for that price. It’s a great way to get rid of stuff and make guaranteed money. 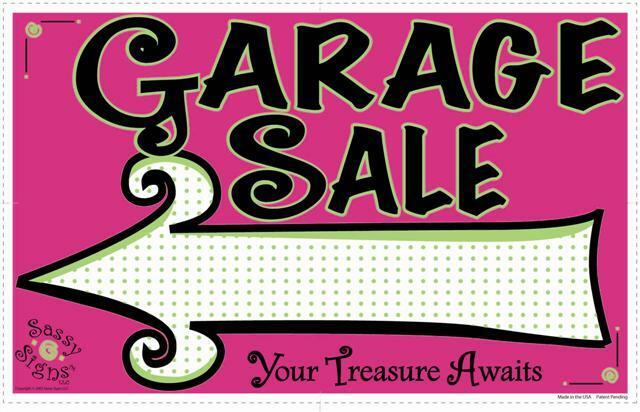 1) Take a set amount of money in your budget for garage sales. Once the money is gone, you are done shopping. 2) Do not buy items you don’t need just because it’s cheap. Only get it if you’re going to use it or give it as a gift within 30 days. This is not an opportunity for your to clutter up your house. 3) Do not take children or people with poor spending habits with you. Just like in the grocery store, children will want everything they see, so to keep the tantrums at a minimum and to avoid overspending, keep them at home. Same goes for your clutterbug of a friend. Don’t take them if they will influence you to be a spendthrift. As the Seller, once you’ve sold all you can, consider offering a Free for All on freecycle. They will come and clean you out and if they don’t, pack up the remaining items and drop them off at a thrift store. Don’t forget to grab your tax deduction slip! !